What can I say about this game except WOW! 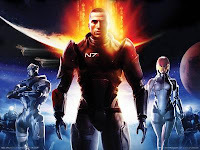 Mass Effect is a Sci-Fi RPG based in the far future where humanity is struggling to make its mark as a useful part of the galactic community. Evil stuff ensues, humanity saves the day, etc.. This is an absolutely fantastic game with a brilliant plot and I'll definately be playing it through a few times so I can see all of the different story lines and twists. It's very similar to the Knights Of The Old Republic games, which I also loved, allowing you to develop your character as you like and taking them through either the good guy or the evil guy path in the game. There are loads of different worlds to explore, tons of upgrades and plenty of additional side missions to keep things going for a while. The makers are even releasing extra planets, missions, and races to pad things out even more. My only problem while playing this is that it's fairly resource hungry and my poor old Nvidia 6800 graphics card could only just handle it. Hopefully I should be able to upgrade this soon and enjoy this game in all its shiny graphicy goodness! A definite 2 thumbs up for this one. I only wish more games were this good.